Winter fog wraps the slopes of Mount Vaught in Glacier National Park. 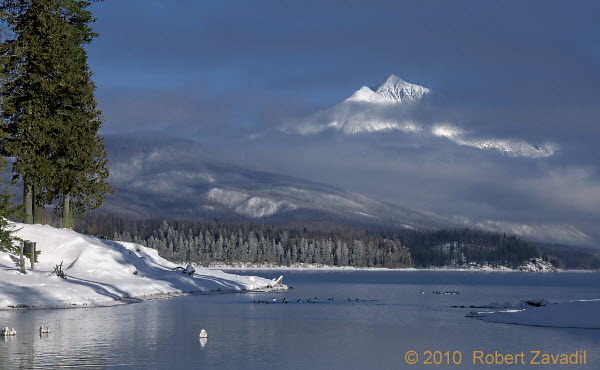 McDonald Creek and Lake McDonald lie in the foreground in this February photo. Copyright, 2001-2013 Robert Zavadil. All rights reserved. All of the photos have all rights reserved worldwide. No form of reproduction, including copying or saving digital files, or the alteration or manipulation of said images is permitted without the express, written permission of Robert Zavadil. We hope you enjoy these images, but please don't copy, print or distribute any of the images without permission.